In 1916, Arthur Eddington, a war-weary British astronomer, opened a letter written by an obscure German professor named Einstein. The neatly printed equations on the scrap of paper outlined his world-changing theory of general relativity. Until then, Einstein's masterpiece of time and space had been trapped behind the physical and ideological lines of battle, unknown. Many Britons were rejecting anything German, but Eddington realized the importance of the letter: perhaps Einstein's esoteric theory could not only change the foundations of science but also lead to international co-operation in a time of brutal war. Einstein's name is now synonymous with 'genius', but it was not an easy road. 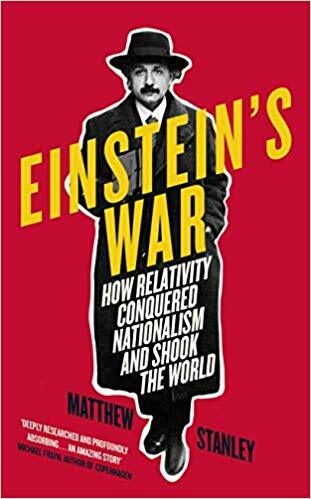 He spent a decade creating relativity and his ascent to global celebrity, which saw him on front pages around the world, also owed much to against-the-odds international collaboration, including Eddington's crucial expedition of 1919 -- which was still two years before they finally met. We usually think of scientific discovery as a flash of individual inspiration, but here we see it is the result of hard work, gambles and wrong turns -- in this case subject to the petty concerns of nations, religions and individuals. Einstein's War is a moving human story of a pair on opposite sides of history who came together for science. It sheds light on science through history, and the physics is more accessible as a result: we see relativity built brick-by-brick in front of us, as it happened 100 years ago.